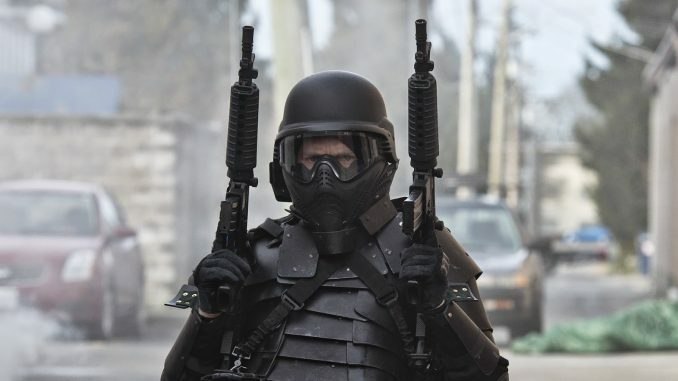 With good justification, the original Rampage was likely Boll’s best-received film, mustering a 6.4 rating in the IMDb – through the end of 2013, Attack on Darfur was his only other ranked better than 4.8. Given its spree killer anti-hero Bill Williamson (Fletcher) escaped capture at the end, leaving a friend as scapegoat for his one-man death march, a sequel was almost inevitable. Have to say though, on first seeing the title, I presume this was set in Washington, Williamson having moved on from the original to go after politicians in the halls of power. 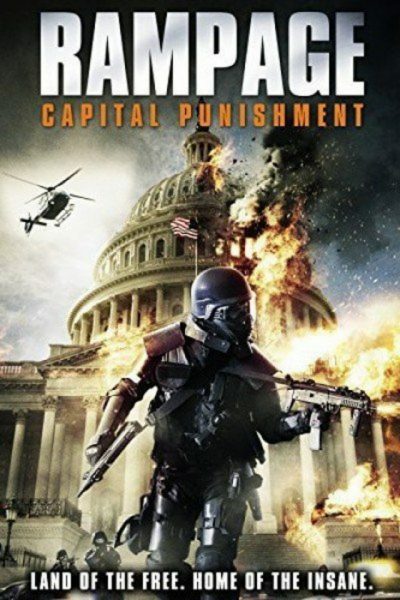 I then realized – somewhat to my disappointment – that would be “CapitOl Punishment”. Instead, this is actually set in Las Vegas – though whoever designed the box-art didn’t grasp the difference either, unless there’s a new “Capitol Hill”-themed hotel in Sin City that I missed [Not a bad idea, actually. Though they’d probably have to bus in more whores to stock the Vegas version] Williamson surfaces after some years underground, with only a viral video message proving he’s still alive, but now intent on bringing his message to as large an audience as possible. Tooling up with body armour and weapons, in the same way as before, he takes over a local news-station, and barricades himself in the basement along with local anchor Chip Parker (Munro). He sends out a DVD with his opening “manifesto” on it, and demands Chip brings back a camera crew to broadcast a live interview with Bill. This is a more difficult and troublesome film than Assault on Wall Street, with the motive for the lead less obvious or sympathetic. Bill comes over more as a smug know-it-all, yelling “WAKE UP, SHEEPLE!” like a certain, irritating brand of conspiracy theorist, and this does weaken the film. Though Fletcher’s portrayal is charismatic, and reasonably coherent, which puts him some way above, say, Anders Behring Breivik [I tried to slog through his “manifesto”, and it’s virtually unreadable] In some ways, this is also a braver movie, because Boll is not picking the low-hanging fruit of making Wall Street and bankers the bad guys. Here, it’s society in general which is the target – and regardless of how much we agree or not with Bill, all viewers are a part of that. If you’re not part of the solution, you’re part of the problem, according to the movie – that’s made clear by the scene where Bill sets up a folding chair in an alley and shoots whoever happens to walk past. Old or young, rich or poor: you come into the crosshairs, and you get taken out. Boll himself shows up as the head of the TV station, who drools over the ratings for his unscheduled programming, and cackles maniacally, rubbing his hands as the syndication fees roll in. That’s clearly satirical, and I’m not certain how well it sits with the deadly-serious tone taken by the rest of the film: maybe Boll might have been better off not playing the role himself, it does seems a little distracting and egocentric. Overall, it isn’t quite as powerful as the original, which had a small-town setting that was more chilling, though this countered by some of the perfectly valid points being made by the mass murderer – the statistics quoted, e.g. about prison population, are largely accurate. It’s certainly unsettling to hear someone who has no qualms about killing anyone who crosses his path, making a reasonable argument in favor of gun control.